The following is an event promoted by the State Historic Preservation Office that may be of interest to our members. 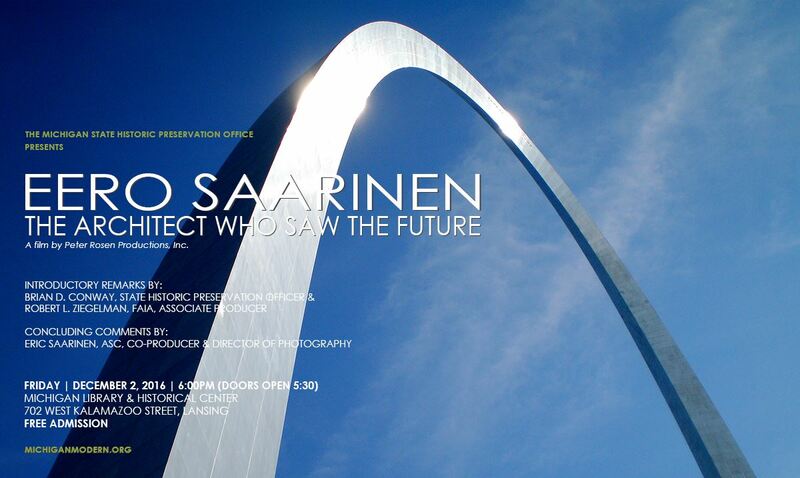 The State Historic Preservation Office is hosting a screening of the new film Eero Saarinen: The Architect Who Saw the Future on Friday, December 2 at 6:00 pm in the Michigan Library and Historical Center Building Auditorium in downtown Lansing. Special guests co-producers Eric Saarinen and Robert Ziegleman will be providing remarks and answering questions about the film and the architectural career of Eero Saarinen. The film screening will be followed by a reception and book signing of our new book Michigan Modern: Design that Shaped America, and viewing of the exhibition currently at the Michigan History Museum entitled Mind on Modernism. Admission to the event is free with doors opening at 5:30. Please join us and please help us promote this event by posting the attached announcements in your facilities, on social media and websites.